Lesbos is one of the East Aegean Islands in Greece, located in the northeast of the Aegean Sea, close to the west coast of Turkey. Greece’s third largest island birthed one of the greatest poets of ancient times, Sappho, while many philosophical academies, led by Aristotle and Epicurus, were held here, too, earning Lesbos cultural significance worldwide. The island’s academic legacy even spans to the twentieth century, when local poet Odysseas Elytis won the Nobel Prize in Literature in 1979. Lesbos isn’t just riding on former artistic glory, though, boasting a varied topography and numerous tourist attractions to keep you occupied. A large seawater gulf penetrates deep into the island, with rugged western plains sweeping around the bay, transforming into a contrastingly lush eastern side, covered with pine trees and countless olive groves. In fact, over eleven million olive trees are cultivated on Lesbos. The impressive numbers don’t stop there; local farmers produce around half the aniseed-flavoured alcohol ouzo sold around the world, so be sure to visit some of the distilleries for a guided tour. Despite Lesbos’ reputation as a traditional, slow-paced slice of Greece, you can find a lively nightlife in the capital, Mytilini, thanks in part to the local student population. This picturesque port town has vibrant clubs and restaurants. But if that’s not for you, the charming churches and excellent art galleries, showcasing Picasso, Chagall and Matisse, can provide some respite from the ouzo-friendly bars. For outdoor pursuits, the wide open countryside offers plenty of fun for cyclists and hikers, with long, winding roads circuiting the island, affording excellent coastal views. The Petrified Forest of Lesbos makes a great day trip, formed over twenty million years ago, earning Protected Natural Monument status in 1985. Another must for the excursion list are the therapeutic hot springs, flowing with some of Europe’s warmest mineral waters, ideal for relaxing after long day of exploration. All ferry routes go to Mytilini, situated on the southeast coast, making Lesbos an ideal Greek destination if you’re coming from Turkey, with fast and regular crossings available across the Mytilini Strait. 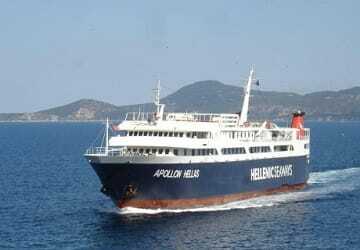 And as with most Greek islands, there is a huge choice of domestic routes from both the mainland and the surrounding archipelagos, all operated by some of the country’s leading ferry companies. For more information, please visit our Ferries from Aegean Islands to Lesbos page. For more information, please visit our Ferries from Ikaria to Lesbos page. For more information, please visit our Ferries from Turkey to Lesbos page. For more information, please visit our Ferries from Samos to Lesbos page. For more information, please visit our Ferries from Greece to Lesbos page. 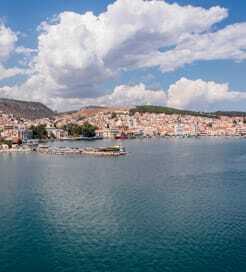 For more information, please visit our Ferries from Cyclades Islands to Lesbos page. For more information, please visit our Ferries from Dodecanese Islands to Lesbos page. For more information, please visit our Ferries from Athens to Lesbos page.